As HubSpot’s annual State of Inbound report has proven, consumer habits have changed drastically. What customers want today is different from what they wanted 10 years ago. That means that companies must change the way they market, sell, and service to match the way people actually want to shop, buy, and be treated – namely, in an inbound way. In the age of the buyer, it's up to businesses to adapt, but there hasn’t been an easy framework to do so. Until now. 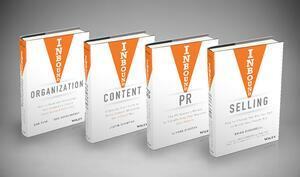 Following on the original Inbound Marketing book that HubSpot’s founders Brian Halligan and Dharmesh Shah wrote 10 years ago, we’re excited to announce today the release of four new books, written by HubSpotters, that expand on the inbound philosophy and help millions of organizations grow better and transform their businesses with inbound. The series includes: Inbound Organization (Dan Tyre, with HubSpot Partner Todd Hockenberry), Inbound PR (Iliyana Stareva), Inbound Content (Justin Champion), and Inbound Selling (Brian Signorelli). To grow better and stay relevant in today’s reality of savvy consumers and noisy digital world, businesses must transform their entire organizations, including the way they run their departments and how they engage with each and every one of their stakeholders. As an addition to the Inbound Marketing book, the inbound books series covers everything a business needs to know to reinvent itself for an inbound world. The inbound books series is currently available in Barnes & Noble stores as well as on Amazon for international markets.